When we consider what it means to “walk with God” there are as many concepts as minds to ponder the subject. In an effort to provide some focus I have taken my example from at least one man who walked with God. While not very much is known about him we can at least make some very strong inferences about his life and his lifestyle. When Enoch was born his great – great – great – great grandfather, Adam, was 640 years old; about 70% through his life. And we should note that while Enoch was growing up Adam lived until Enoch was 290 years old. If you take this one step further you can see that Enoch left this earth just 75 years after Adam. At that point in time all of the others were still alive: Seth, Enos, Cainan, Mahalaleel and Jared. Now with these facts from the Bible let’s examine a couple of possibilities. He must have spent hours thinking of what might have been if there had been no sin in the garden. I am sure he wondered what God meant when He said … and I will put enmity between thee and the woman, and between thy seed and her seed; it shall bruise thy head, and thou shalt bruise his heel (Gen 3:15). How he must have hungered to have what Adam had in the Garden of Eden and how he must have sought after God? How do we know he sought after God? Look at what the scripture has to say. In the entire list of his ancestors Enoch is the only one who is described as walking with God. Not only did he walk with God but he walked with Him for 300 years. What a relationship! I’m sure the others (Adam through Jared) must have thought he was nuts. They probably were quick to remind him that kind of relationship ended in the garden and it was different now. Don’t you know that you can’t do that? Funny how that works isn’t it. Those who miss the boat always seem to find fault with those who don’t. Here is Enoch walking down the path and they cry out, Hey Enoch, what are you doing? He just smiles and replies Oh, just walking with God. We can be sure there was a great deal of head shaking going on. That’s not the way it’s done! Doesn’t the boy get it? God’s not here anymore He’s off up there somewhere. We’re just supposed to make sacrifices to Him and hope He provides for us. If He does come down here it’s in the garden and we can’t go in there! But the Word of God seems to be pretty clear and indicates that Enoch did “get it.” So let’s look a little deeper. Jude 1:14 And Enoch also, the seventh from Adam, prophesied of these, saying, Behold, the Lord cometh with ten thousands of his saints, 15. To execute judgment upon all, and to convince all that are ungodly among them of all their ungodly deeds which they have ungodly committed, and of all their hard speeches which ungodly sinners have spoken against him. … behold he comes with ten thousands of his saints, to execute judgment upon them, and to destroy the wicked, and to strive (at law) with all the carnal for everything which the sinful and ungodly have done and committed against him. Some suggest that this book was not available to Jude and that God revealed it to him. Whatever the answer I believe it validates who Enoch was and what he was doing. He was preaching against those who opposed God and worshipped idols. Is it possible that he was referring to some of his immediate ancestors; those listed in Genesis 5? Could that be why they might have questioned him? 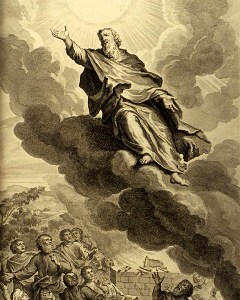 What we see is a fairly clear picture indicating that Enoch was a prophet of God. The inference to Enoch’s prophecy is that the Jews, like Noah in the flood, will be saved during the tribulation. The church, like Enoch, will be caught up and transfigured before the tribulation (2Cor 4:14, 1Thes 5:9, and Luke 21:28, 35-36). Remember, just because Adam and Eve had been tossed out of the garden did not mean that man had forgotten who God was. We can’t ignore the sacrifices made by Cain and Able; they had to learn that from someone. So here is Enoch warning the ungodly of the ungodly deeds they had committed and of all the words they spoke against God. Somehow, in the midst of a world that wasn’t communicating with God Enoch got through. It seems logical to me that the God I know (the one who is the same yesterday, today and forever) must have been looking for somebody who cared enough to pursue Him and desire to spend time with Him. We know that Abel had a pleasing sacrifice to God and Cain did not, but how did they really interact with God? Did Adam ever try to reestablish a close relationship with God? Enoch did because his heart longed to have what Adam had in The Garden; a personal relationship with his creator. Remember that Adam walked in the cool of the day with God. I am pretty sure that if Abraham was called a friend of God then so was Adam. I imagine that Enoch did a lot of preaching and prophesying during the 300 years he walked with God. I believe he told the people exactly what he heard God say; how God longed for His people to desire Him and turn from their wicked ways. Does that sound like others we know: Noah, Moses, Elijah, Isaiah and Jeremiah? Whatever it was that Enoch did during those 300 years we are certain of one thing; he pleased God. In fact, as we noted earlier, he pleased God so much that instead of dying like all those around him he was just “taken up to heaven” to be with God. Gen 6:9 … these are the generations of Noah: Noah was a just man and perfect in his generations, and Noah walked with God. Note that in both instances it is different than “walking before God” (Gen 17:1, 24:40) or “walking after God” (Deut 13:4). The only other place we see the expression “walk with God” used is in Mal 2:6 in reference to Levi. There it refers to the conduct of the Levites who were the priests and stood in a close relationship with Jehovah. They were the ones permitted to enter into the Holy Place and talk to God directly. This seems to be the kind of relationship that Enoch had with God and the end result, like that of Elijah was incredible. The Hebrew word that Moses used in Gen 5:24 for “took” (laaquach) is only used in two places where death is not its meaning. Here in verse 24 and in reference to Elijah in 2Kings 2:3,5. It means a taking away by extraordinary means and to take away to oneself like a wife. The idea of death is not attached to it anywhere in the Bible. Enoch was about half way between Adam and the flood (about 987 years after the creation of Adam) just walking with God one minute and the next he was gone. No death, no body, no dust … just gone! We see the reason for it in Heb 11:5; he pleased God. How did he please him? Look at the first words in verse 5; BY FAITH. Enoch’s faith in the God of Adam was what pleased Him and I am sure that in walking every day, by faith, he endeared himself to God. While all those around him exercised little or no faith, Enoch simply said that there is a God, He created me, I love Him for it and I want to know Him. He exercised his faith and stepped out to find God. Guess who was waiting for him in the cool of the day? I believe with all my heart that God is just waiting for all the Enochs in this world to step out in faith and say, “God, I want to know you more.” How His heart must soar when one of His children sets out on the journey to discover who He is. Each one of us can experience the same walk Enoch had with God. We can enjoy Him to the fullest every minute of the day if, like Enoch, we ignore the unbelief of those around us and look up to the God of Enoch, Abraham, Isaac, Jacob, you and me. Remember that “without faith it is impossible to please God” (Heb 11:6). Sounds too simple doesn’t it? But that is the foundation of anyone’s walk with the Lord. Is it possible for us to be translated like Enoch? Why not? Many believe that what happened to Enoch is a foreshadowing of the rapture or snatching out of the church before the last days. I will go out on a limb and suggest that God does not change and it is certainly possible for any one of us to be taken home like Enoch, if not like Isaiah (what a hearse he had). So why haven’t we seen it happen in our time? The hunger we have toward God gets clouded and covered up by all of the pressures and struggles of this world. We get so focused on ourselves that we overlook the reason that we were put here in the first place, for thy pleasure they are and were created (Rev 4:11); also Ps 147:11/149:4, Luke 12:32, Eph 1:5/1:9, and Phil 2:13. We need to take time and just reach out to the Lord with a hungry heart. That is all it takes to set God’s heart leaping with joy. Did you know that God has joy? We are His joy and every time we take time away from our selfish interests to pursue Him it brings Him joy. We have His written Word to reveal who He is through His Son. Let’s begin building a foundation with Jesus as the Chief Cornerstone. It is an exciting opportunity to get to know the creator of the universe, the one who knew you before you were formed in your mother’s womb. It only takes desire on your part and a willingness to spend time with Him. The Holy Spirit will accomplish all the rest in God’s time and on His schedule. He will show you things you never dreamed of and allow you to experience the fullness of life as He intended it to be. The primary goal of the bride of Christ in life should be to have the testimony that she pleased God and to leave this life just as full of Him as she can be. We can all get there, each one in his or her own way and own time. We can all Walk Like Enoch if we just reach out with a hungry and repentant heart and let the creator love on His creation. As the bride we need to be with Him in the Holiest Place and all we need to do to get there is use the same secret that Enoch used — faith. ← Oh Lord, I’m Sorry! one of the best massage of all time and in my life. It hits home… sorry for the delay in responding as I was out of town.